As you can imagine: before we can leave on such a long trip through so many countries, there's heaps to do! This page shows the last preparations before we left the Netherlands on the 31st of July, 2006. You can find more preperations concerning Health in our Tips & Tricks section. This will show you what we went through medically before we left on our trip and what happened while we were on the road. There is also a seperate page about our Insurance and why we never used it. The money page shows everything where money is involved, including our calculations of the amount needed on our 5 and a bit year round the world trip. 31-07-06 WE'RE OFF !!! SEE YA !!! 17-07-06 the house looks rather empty after our huge Garage Sale this weekend. And we took away a couple of car loads of other stuff to the tip. Only the books, lp's and cd's to sell and off we go! Two weeks !! 08-07-06 the auction at the Party (thanks to Hayley and Ronnie!) put € 252,27 in the pocket. Money to be spend on (a) good cause(s) somewhere in the world. Thank you, all of you. We'll keep you posted about the destination of the money. 01-07-06 1 month to go... things are speeding up and the house looks like a mess, boxes everywhere. Two weeks before the total clearance sale here. Everyting must GO ! 18-06-06 Our beautiful pussycat Lotje has found a new home today. With tears in our eyes we said goodbye to a good friend. 28-04-06 Upgrade of the Simpleviewer slideshow. Unfortunately it wasn't working in IE anymore... but it's fixed! 27-03-06 we've planned all our vaccinations; May will see 6 more injections against -among others- typhoid and rabies. 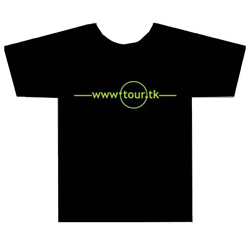 03-11-05 we are now the proud owners of our own www.tour.tk t-shirts. But -even better- you can get one too! SORRY : SOLD OUT !! Send us an email if you want to buy one (or more) with the type of shirt, size and quantity. T-shirts are € 10,- each excluding postage and handling. Within The Netherlands this will be around € 2,00 per shirt. Please ask for a more specific quote if you want more shirts or require overseas shipment. 04-10-05 we had our first talks with the bank about our plans. Organising our finances from abroad doesn't seem to be a problem at all ! Even if the trip is gonna last five years. We'll be able to manage all our bank accounts via the internet and correspondence between us and the bank will be via e-mail. 21-09-05 our business cards are ready! We can now start promoting our site. Thanks to Tibor and Roos & Roos . 11-09-05 we have successfully (!?) finished a bicycle maintenance course and, while learning how to spoke wheels, met with several other cycle enthusiasts on this nice weekend in the province of Groningen, The Netherlands. For more info: check the Wereldfietser website or the instructor's: M-gineering.